Stay updated and get free trading tips! The recent stock market volatility has provided a lot of great opportunities for us at Investors Underground. While many try to predict what the stock market will do in the coming months, we simply focus on the opportunities that are right in front of us. That’s one of the benefits of being a day trader. Because we don’t hold stocks for long periods of time, we can get in and out of moves stealthily before the market surprises us with a nasty turn. Best of all, because we go long and short stocks, there will always be opportunities to profit. @AT09_Trader @InvestorsLive You do great webinars. Great at explaining. Keep up the good work. Investors Underground has recently launched it’s day trading alerts for the top stock trades on the day. Every day, a new post will be added going over the top stock trades for the day. The post will outline the trade setup, how it was played in the Investors Underground chat room, and what the game plan is for the rest of the day. Occasionally, there will also be profit charts posted so traders can better understand how the chat room profited (or lost) from the trade. Traders will have the opportunity to sign up for email alerts so they don’t miss out on new posts! 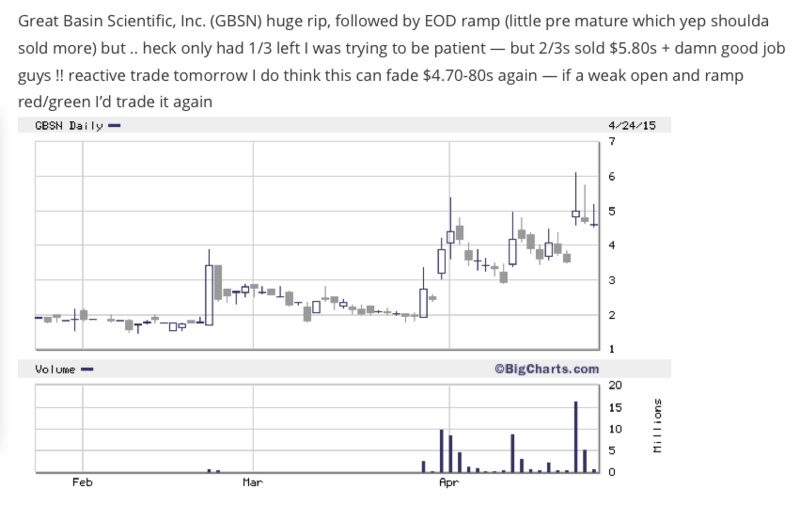 Feel free to check out the recent top stock trades here. 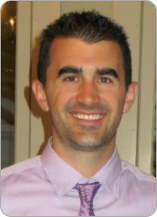 Nathan Michaud has been providing great day trading resources for a long time. Now, things are about to get even better! Investors Underground just launched a free blog to help traders of all skill levels improve their trading strategies. This blog features a variety of different types of articles and videos that will help you become a better day trader. These articles focus on day trading strategies, trading psychology, trade recap video lessons, and so much more! This is just the beginning. Prepare for a lot more top quality, free content on trading stocks and becoming successful in the markets. Make sure to check out the blog – bookmark it, subscribe to posts by email, whatever you have to do! We had another great week in chat! 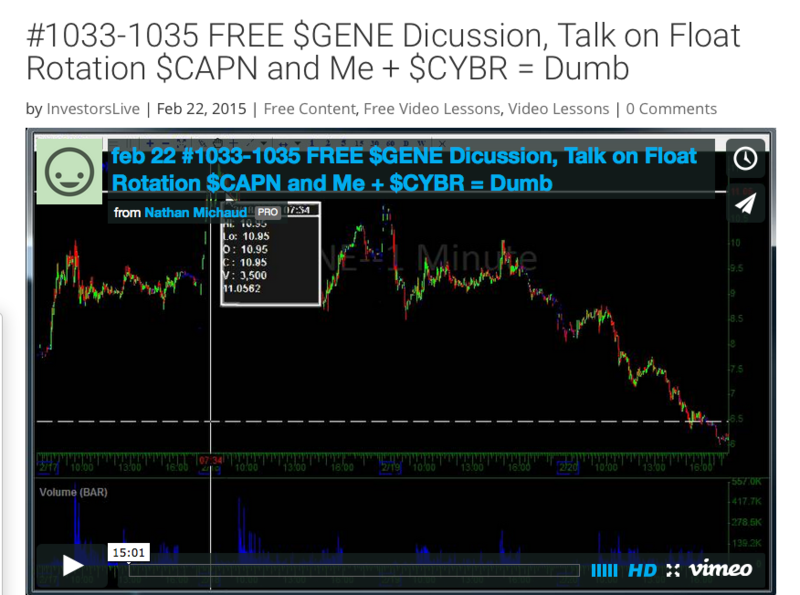 This week, we were focusing on the stock GENE among others and we nailed the trades. 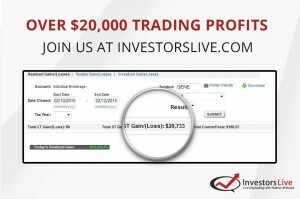 Plenty of members profited and I cleared over $20,000 in profits in a couple of days. How did we do it? Simple. We find the hot stocks and we apply our trading rules to them. Focus is key! Focusing on a few tickers helps prepare you for the big moves. Check out this free video lesson I put together explaining my rationale behind the GENE trade. If you want to learn even more, check out some free blog posts at Investors Live. If you want to join us in chat, sign up at Investors Underground. Nathan Michaud has been consistently profitable with his trading strategy for years now. Through a combination of technical analysis and proper money management, Nate has been able to develop a trading methodology that works, and continues to work. It should come as no surprise that Nate is a renowned day trader and many look to learn from his strategies. The good news is that there are a variety of ways that people can learn from Nathan Michaud. 1. Investors Live – Investors Live was home to Nate’s personal blog where readers could get tons of valuable information for free. Yes, everything on the blog is 100% free. This is where you could get Nate’s insights on the market, free video lessons, exclusive discounts on services, and so much more. InvestorsLive has now been merged with Investors Underground, where free courses and blog posts are available. 2. Investors Underground – Nate is the founder and one of the chat room moderators at Investors Underground. Investors Underground is a trading community that gives people all of the tools they need to succeed in the stock market. Every night, a stock scan is sent out. This scan contains stocks that may see big moves the next day. The scan includes charts, details of the expected trade, and a rationale. Investors Underground also includes an active chat room, run by a team of skilled day trading moderators. This chat room is the best scanning tool you can find because it aggregates the insights of traders from across the globe. Here, you can get stock alerts in real time. 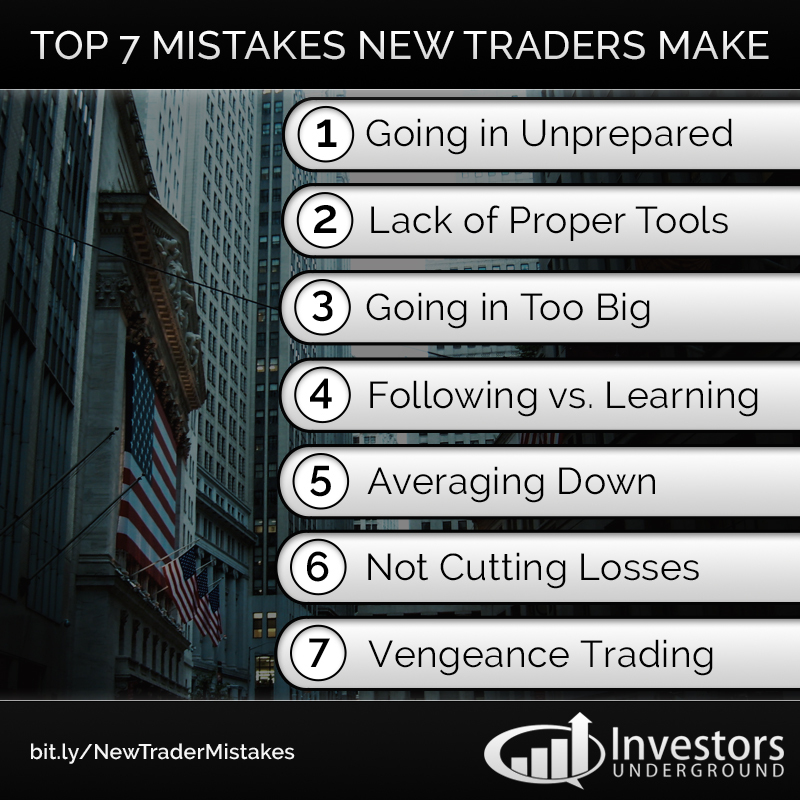 On top of all this, Investors Underground offers video lessons for those looking to consistently educate themselves. Every day, video lessons recapping the day’s trading session are posted at Investors Underground. Investors Underground is a great resource for traders of all skill levels. 3. Educational DVDs – Getting an edge in the stock market is all about educating yourself. Those who dedicate an appropriate amount of time to education tend to see better trading results. Investors Underground launched the beginner’s trading course, Textbook Trading, a few years ago, and it is now the #1 rated DVD on Investimonials, a financial product review site. Due to popular demand, Investors Underground released a second DVD called Tandem Trader in 2014 to give traders access to real-time trades. Tandem Trader is loaded with live stock trading videos, following each move tick-by-tick. 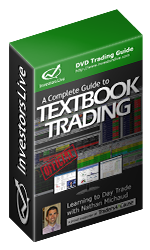 This second DVD is a must have for any serious day trader. It’s no surprise that the DVD became the #2 DVD on Investimonials in only a few months. If you’re looking to learn more about trading, do so in whatever way works best for you. You can start by reading free blog posts on Investors Underground, invest in an educational DVD, and then trade alongside the veteran traders at Investors Underground. Know Your Priorities 🙂 Tandem Trader !! Have questions about the chat room? Ask us! 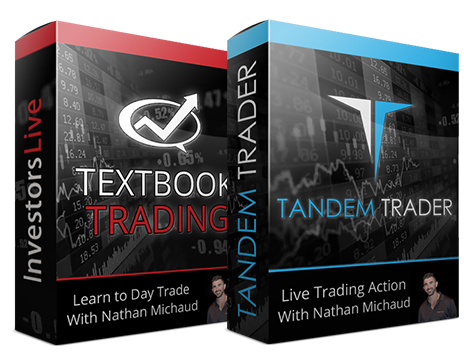 You can day trade with Nathan Michaud live right here! @InvestorsLive I alerted short $ECRY in @IU_Chat yesterday at .55 before the crash – best chat on the net folks!!! Traders4ACause Raises and Donates $100,000 !!! 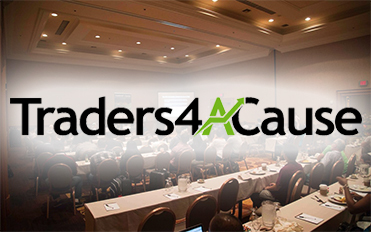 Traders4ACause a charity founded by traders exceeded expectations on their first year! Eric Wood Nails it Again! Eric’s been having a record breaking year this year!